Since reading is what I usually list when asked for a hobby, and I’m the daughter of a librarian, and I live in Texas (the Round Rock school district even), it’s no wonder that Banned Books Week jumped out at me as something to mention here. It’s held every year in the last week of September – that’s this week! So, I started digging around online for more information. Did you know that out of 10 most frequently challenged books of 2007, eight were challenged because of sexual content? Did you know that the Harry Potter series is #1 on the list of most challenged books of the 21st century? Did you know that for the 2nd consecutive year a book based on the true story of two male penguins caring for an orphaned egg tops the most frequently challenged book list? Did you know that the third most frequently challenged author last year was Mark Twain? A challenge is defined as a formal, written complaint, filed with a library or school, requesting that materials be removed because of content or appropriateness. So why would someone challenge a book about penguins? Reasons given were: Anti-Ethnic, Sexism, Homosexuality, Anti-Family, Religious Viewpoint, Unsuited to Age Group. Now, I’m not necessarily ready for my six-year-old daughter to go check out Forever or even Are You There God, It’s Me Margaret (both frequently challenged books many times over the years); but, I’m certainly glad both titles by Judy Blume were available in my junior high school library growing up. And when she does get to an age where she’s learning about her sexuality, I expect book authors will fill in some of the holes I miss or she’s too uncomfortable to ask about even after we talk about the subject. That’s the way it worked for me growing up. Speaking of Judy Blume and my youth, it turns out that my very favorite book of hers, Tiger Eyes, was actually self-censored by the author, and yet still turns up on the American Library Association list of the 100 Most Frequently Challenged Books of 1990-2000. Some of the other books I’ve read that have faced challenges over the years include A Wrinkle in Time, To Kill a Mockingbird, The Outsiders, Brave New World, Sleeping Beauty Trilogy (ok, so that one I probably wouldn’t want in the school library), Cujo, James and the Giant Peach, Carrie, Where’s Waldo (really? That was challenged?) and the classic, How to Eat Fried Worms. And there are many more that I should have read that have been challenged, such as: I Know Why the Caged Bird Sings, The Adventures of Huckleberry Finn, Of Mice and Men, Bridge to Terabithia, The Catcher in the Rye, Ordinary People, Slaughterhouse-Five, Lord of the Flies and The Adventures of Tom Sawyer, just to name a few. So, in honor of Banned Books Week, I’m going to go out and read one of them. Check the list for one that you’ve been missing in your personal library and join me! Instead, I went with Bridge to Terabithia, a book that made the “10 Most Challenged” list in 1991, 1992, 1993, 1994, 1995, 1996, 1997, 2002 and 2003. I’m guessing it has been on that list even more since it was first published in 1977 (and won a Newbery Medal in 1978), but that’s as far back as I could find records. It has apparently been challenged for using offensive language and promoting Satanism. Were the people who said that reading the same book I read?! Today in Austin, TechCrunch is hosting a Roundtable: The Web Starts At The Grass Roots. I admit that I’d heard something a while back about it — mostly that tickets to the after-party were going fast. Lots of people wanting to see and be seen, I figured. But, not being a regular TechCrunch reader I apparently missed the more important call for speakers at the roundtable. In hindsight, even if I had seen it I probably wouldn’t have submitted my name. TechCrunch and their partner in this event, Austin Ventures, both seem to exude to me this start-up-company, insiders-only vibe in which, as a basic corporate cog, I would not have felt worthy of being included. My bad. Gosh darn it, though, some women should have done it! After reading the article, I fired off a snide comment on Twitter. Soon, other comments and questions about the event started crossing the twitterstream. Then I saw that you could comment on the newspaper story online, so I did that, too. In those same comments, and in Twitter, two men I have nothing but respect for [ @daddyclay @mikeneumann ] pointed out the part of the story I excerpted above. If there was an open call for people to join the roundtable and absolutely none of the Austin women who work in tech and social media responded, then that’s our bad. What I really wanted to explore here, though, is why does this topic rankle me so much? I’ve always deliberately avoided joining many women-focused organizations, opting for the International Association of Business Communicators over the Association for Women in Communication, for example. In issues of gender I’ve generally thought it made more sense to integrate into the broader professional group than to branch off into a specialized organization. I want to be thought of as equal. How could I do that if I set myself up as different? Does the fact that I’ve found myself upset by this topic enough to blog about it and write an op-ed about it mean that my long-held views are changing? Is it due to that fact that I’m now the mother of a girl and more likely to fight for her rights than mine? This deserves some self-reflection, I think. In the meantime … maybe I should start a side business running a tech-women’s speakers bureau! Yeah, right, like I need another job to add to my list. I’m In. Are You In? Have you heard about Blog Action Day? It’s coming on October 15. According to my emanciPET.org calendar, that’s the day before Feral Cat Day. The good news for you is that I’ll be doing a special post here on Blog Action Day, but not Feral Cat Day*. If you have a blog, you can join in, too! I often feel a bit overwhelmed by all the needs in the world and all the places I’d like to donate and help. Too many choices often leads me to no decision. If you feel the same way, don’t think of this as one more group calling for your help, but rather as one very easy way you can do a little something. Saw that they had added some new themes for those of us using IABC eXchange and thought I’d try out a new look. What do you think? I liked the fact that it was easy to customize the main image in the header. Opted to go with the same image I’ve been using on my Twitter page since Earth Day this spring, but there were several other potential designs. And, as I surfed my Flickr photostream this evening I found a few more that I’ll add to this set when I get a chance tomorrow. Feel free to comment here, or in Flickr, on any other designs you like better. 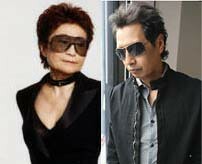 Is it just me, or do Alejandro Escovedo‘s latest publicity shots make him look a bit too much like Yoko Ono?